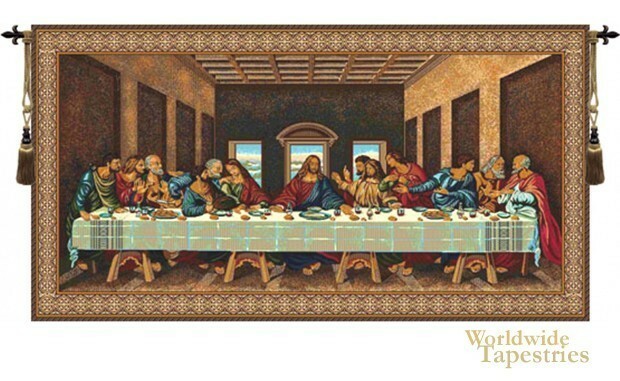 Perhaps one of the most famous pieces of da Vinci, this tapestry shows the "Last Supper" of Christ where he is surrounded by his disciples. This scene portrays the reaction of each disciple when Christ announces his betrayal. The disciples are grouped in threes, a symbol of the trinity, as is the three windows in the room. The original was created as a mural for a building of the monastery of Santa Maria in Milan, which was later refurbished into a dining room. On the opposite end of the room is a mural of the Crucifixion. The original has faded in color, but this reproduction infuses the original with color which would have been brighter than what we know of the piece today, when originally created. This Renaissance tapestry is backed with a lining and tunnel for easy hanging. Note: tapestry rod and tassels, where pictured, are purchased separately. Dimensions: W 50" x H 26"
Dimensions: W 100" x H 50"